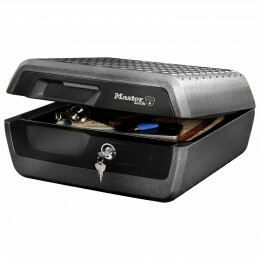 The Sentry 1210 Fire Chest offers real protection for your digital media and paper documents from fire. Ideal for use in the home and can be bolted down if required. 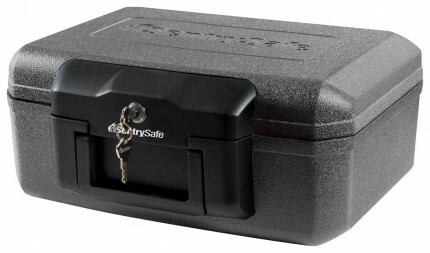 The Sentry 1210 Fire Chest will provide you with 30 minutes fire protection for your digital media like CD and DVD, USB devices as well as important paper documents such as passports and birth certificates. 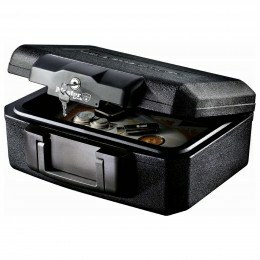 It has an integral carrying handle for ease of movement and a key lock with 2 keys included. The Sentry 1210 fire resistant documents chest is tested by U.L to temperatures of up to 843°C for 30 minutes. The Sentry 1210 will protect your documents from fire and also offers you a Sentry lifetime after-fire replacement guarantee. What Legal Documents should you safeguard from fire? I've been burgled - "What Should I Do?" What are UL and ETL Fire Ratings? If our Buyers Guides have not been able to help you or if you have any general enquires please feel free to use our contact us page, or call on 0800 567 7549. 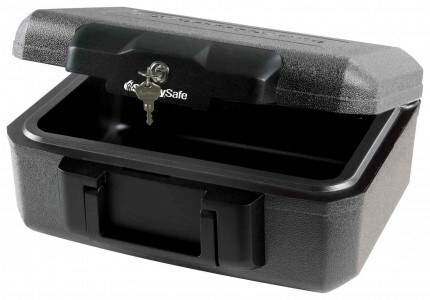 Bronze Rated cabinets and safes are entry level lower security products that offer resistance to opportunistic theft and usually have no independent security test certificate, although the manufacturer will have performed an in house evaluation. This safe or cabinet is designed to offer Fire resistance to protect paper documents, but has no formal test certification. The 30 minutes fire resistance is provided by usually inserting fire resistant material between the inner and outer body of the safe or cabinet. Who is Robert and what are his ratings? *All Steel Storage and Safes with weights exceeding 100kg will be liable for an extra charge if delivered north of the line between Glasgow and Edinburgh. Lockers and Steel Storage are delivered to your nearest kerbside entrance in 10-15 working days unless specified on the individual product. This policy is offered in addition to your statutory rights. You may return your purchase to Safe Options for a refund by obtaining a Customer Return Authorization (CRA) number within 14 days of the delivery date. To obtain a CRA please e-mail your invoice or order number and reason for return using the contact form. Alternatively you may contact our customer service department on 0117 929 2104. 1. You must have received a CRA number from our customer service department. 2. The product must be in "as new" condition, with original packaging and with all manuals and accessories. 3. You will receive a refund excluding the original delivery charge included in our price. 4. Special services such as Professional Installation are non-refundable. 5. 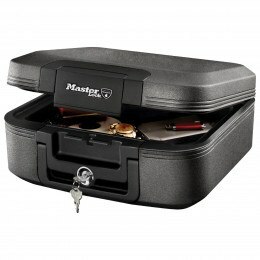 Made to order items such as cut keys, keyed alike locks, Steel Cabinets and Lockers are non-refundable. 6. Products with bespoke modifications that are not available to order online are non-refundable. 7. Goods shall be returned to Safe Options Limited or their named agent. ANY POSTAGE AND PACKING COSTS INCURRED ON RETURNED ITEMS ARE FOR THE BUYERS ACCOUNT AND ARE NON-REFUNDABLE. 8. Please allow up to 28 days for refunds to be processed and credited to your account. If the product you purchase is faulty, we may offer a repair, exchange or refund as appropriate in accordance with your legal rights. Please email customer services or contact us on 0117 929 2104 if you feel your purchase is faulty.